In the first semifinal between Srilanka and Pakistan at the Premadasa stadium, Srilanka elected to bat on winning the toss on a powdery wicket. Srilanka brought in Rangana Herath to strengthen their spinning arsenal, and Tanivir added to the Pakistani side to bolster their pace. Both the sides were getting in to the match with a good bowling attack. A score of 145 to 150 looked a good score to defend on this pitch. 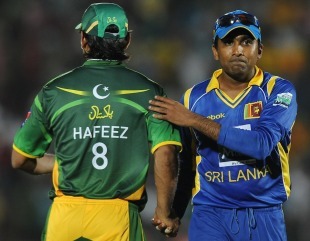 Srilanka, were given a reasonable start by Jayawardene 42 of 36 and a subdued Dilshan 35 of 43. A score of 150 plus was expected, when Srilanka were going strong at 84 for 2 in the thirteenth over. Pakistan kept Umar Gul for the final overs, and what a spell he bowled. Bowling in tandem with Hafeez and Ajmal, Umar finished with 3.0.26.1, sixteen of which came in the last over, through some lusty blows by Perera and Mathews. Perera with 11 of 7 and Mathews 10 of 6 remained unbeaten, to take Srilanka to 139 for 4 in twenty. Apart from Gul, Hafeez, Ajmal and Afridi picked up a wicket each. A score of 140 can go any way. All it required from Pakistan was to bat through the twenty overs, without losing wickets up front. Pakistan started sedately, and were 55 for 2 in 9 overs. The story of Pakistan batsmen failing during crucial stages was repeated and soon they were facing defeat with seven down for 113 in the eighteenth over, and Srilanka closed the match with Pakistan finishing at 123 for 7 in twenty, to leave Srilanka victors by 16 runs. Hafeez was the only batsman to contribute with 42 of 40. The spinners Ajanta Mendis 4.0.27.2 and Rangana Herath 4.0.25.3, spun Pakistanis out, supported by Angelo Mathews returning good figures of 4.0.27.2. Srilanka is through to the finals, and wait for the winners of semifinal.2. between West Indies and Australia. My strong cricket sense says, it will be West Indies vs Srilanka, with Srilanka ultimately reporting trophy. May the better team on the day succeed. I have seen this game and this was a very close fight between the two rookie of each teams. by the way maybe your'e interested to add our games that related to your niche. if your'e interested please leave your email below my comment ill gonna get back here!